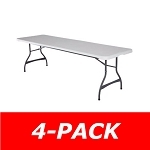 Lifetime 80410 8 ft Tables (4) and Chairs (32) Combo Pack on Sale. In Stock - Usually ships out next business day. 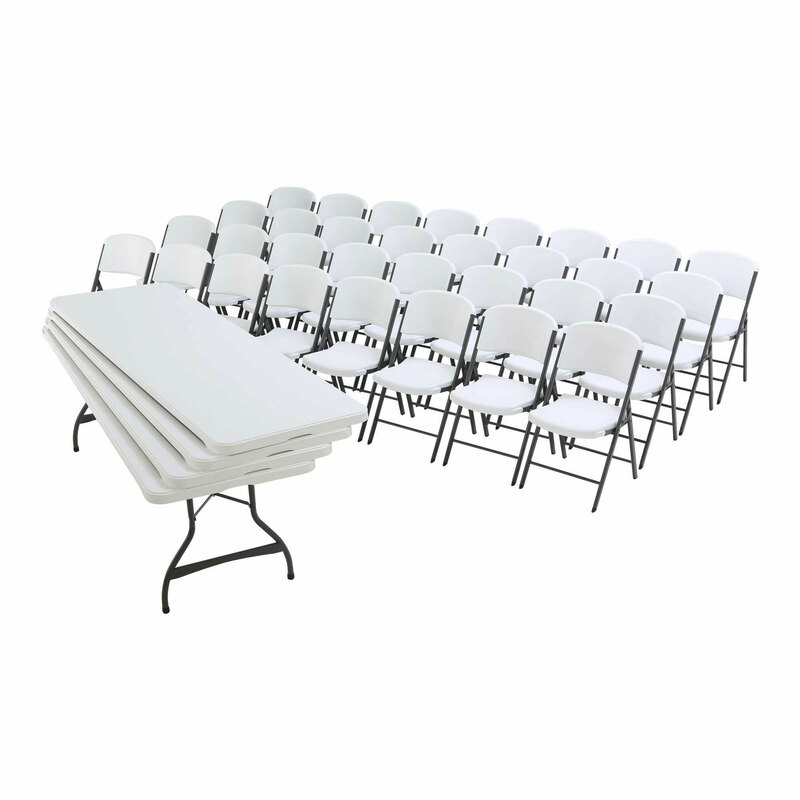 Ordering in this bundle saves over $50 compared to ordering the tables and chairs separately! This bulk package is perfect for business who rent out equipment for parties or for organizations who host training meetings, seminars, banquets and more. Great for churches and wedding companies as well. The brilliant white is great for any occasion. Save money buy getting bulk quantities. This pack can accommodate 32 guests. The chairs fold up and the tables not only fold up - they stack as well for transport and storage. With a 10-year commercial warranty these indoor/outdoor plastic resin tables will last you through thousands of events. The feet are non-marring and the tables lock into place for safety. The tables can be easily cleaned and moved by just one adult. Storage carts are available sold separately. 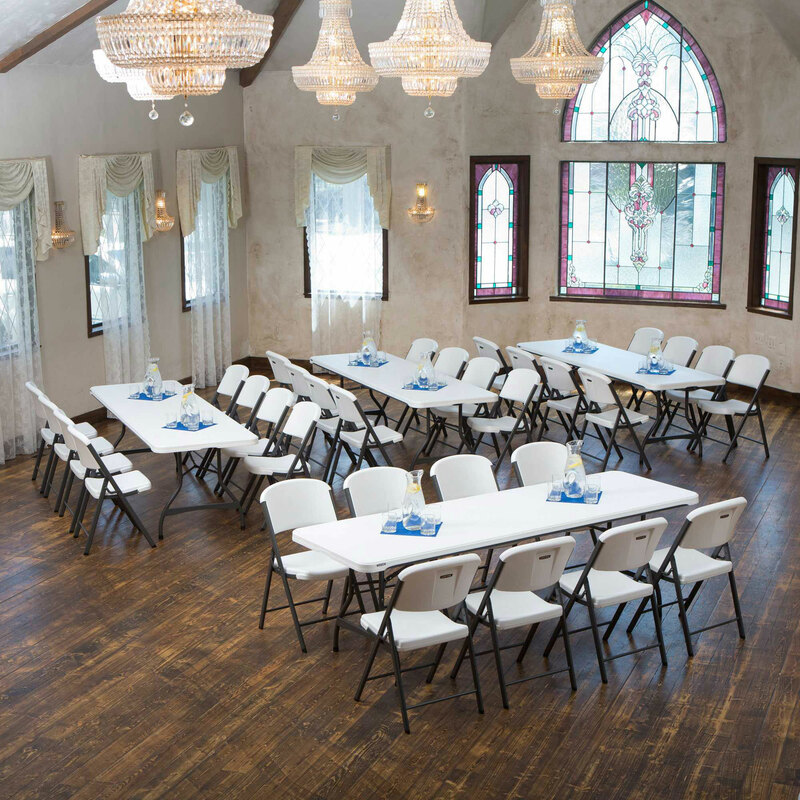 Common Uses Include: seminars, banquets, wedding receptions, classrooms, trade shows, teacher lounges, cafeterias, restaurants, cafes, outdoor gatherings, picnics, Sunday school classes, conferences, seminars, scrapbooking, home crafts, and more. 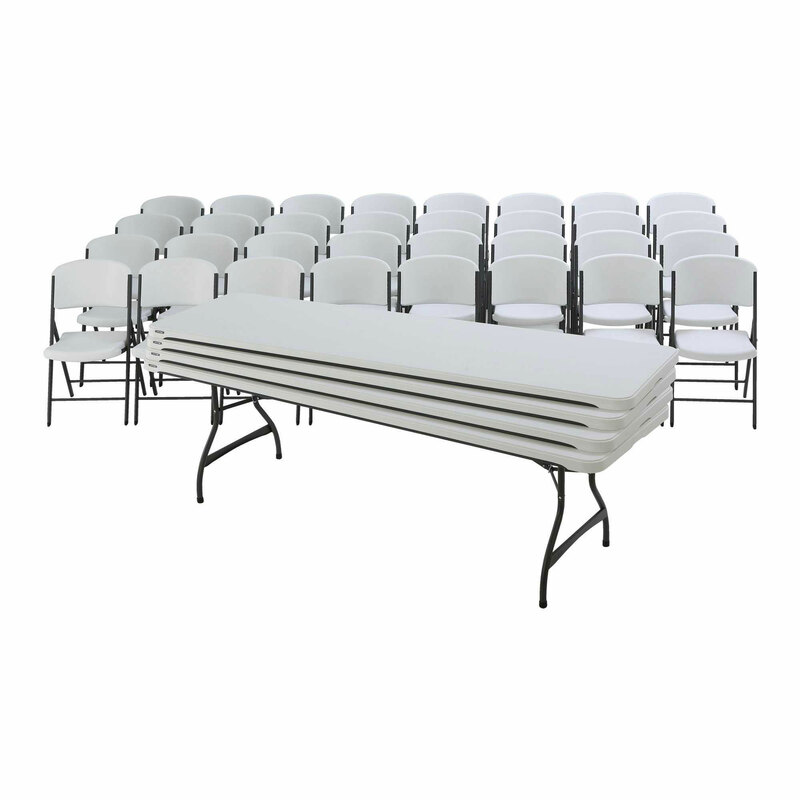 Number of Tables and Total Seating: Depending on your intended use this package of folding tables provides enough seating space for 32 people. 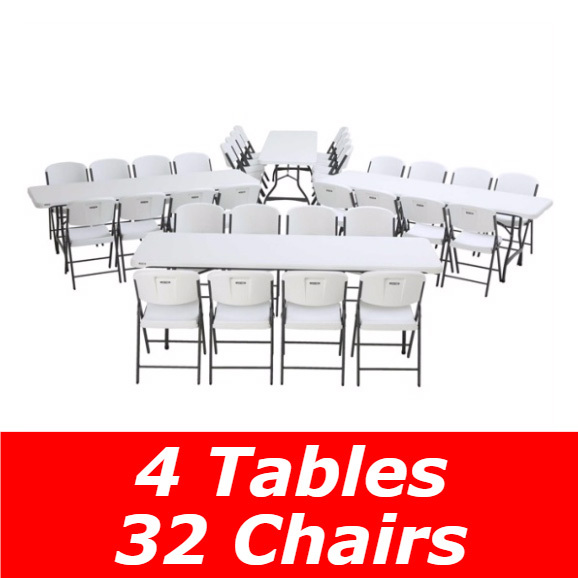 Includes 4 tables and 32 chairs. Table Top Design: Newer Stacking/Nesting (as opposed to the older-style non-stacking design) - Allows you to store tables stacked on one another without sliding around during transportation and storage. Table Folding Option: Solid table top does not fold in half. There is no seam in the plastic on the top. Table folds up flat for storage and transporting. Impact Resistant Corners: Engineered for superior durability and strength to prevent denting upon impact. UV Inhibitors: Lifetime tables are made with UV protected plastic to ensure it won't fade over time. In fact, it's the same material on our Lifetime storage sheds. Leg Style: Wishbone - Goes down straight then widens out for stability. The broad leg stance maximizes stability. Leg Locking Mechanism: Welded Locking Ring - prevents unintentional closing of table. Table Top Color: White Granite - bright white with tiny speckles. Indoor and Outdoor Use: Yes - designed for both indoor and outdoor use. Rubber Feet Caps: Non-marring foot caps for all surfaces. Assembly: No Assembly Required-comes completely assembled and ready to use. Need more chairs? These come in 4-Packs and 32-Packs. Need more 8' tables? These come in singles, 4-packs, and 21-packs. Accessories: Most of our tables have chairs that match. Please scroll down to the very bottom of this page to see matching chairs or other table purchasing quantities. Check out the entire Lifetime Chair product line which includes chairs in many colors including White Granite, Almond Color, Putty Color, and Black. Please scroll to the bottom to see whether a storage cart is available. Warranty Details: The warranty covers normal use. Because these tables are so durable there are very few warranty claims. Generally, filing a warranty claim requires a few digital photos of the defect as well as a copy of the receipt. Please retain a copy of your dated sales receipt should you need to file a claim in the future. Also, we do keep a copy of your receipt on file for just that purpose. These products are built with top-notch quality and we want to make that clear to our customers. Our church has had some of these for years and years. Very impressive looking and very sturdy. They have been used for hundreds of functions throughout the years. Many people have purchased these for home use as well. In fact, some people even borrow them from the church from time to time. Im a big fan of these tables and chairs. They even had these set up at our wedding. 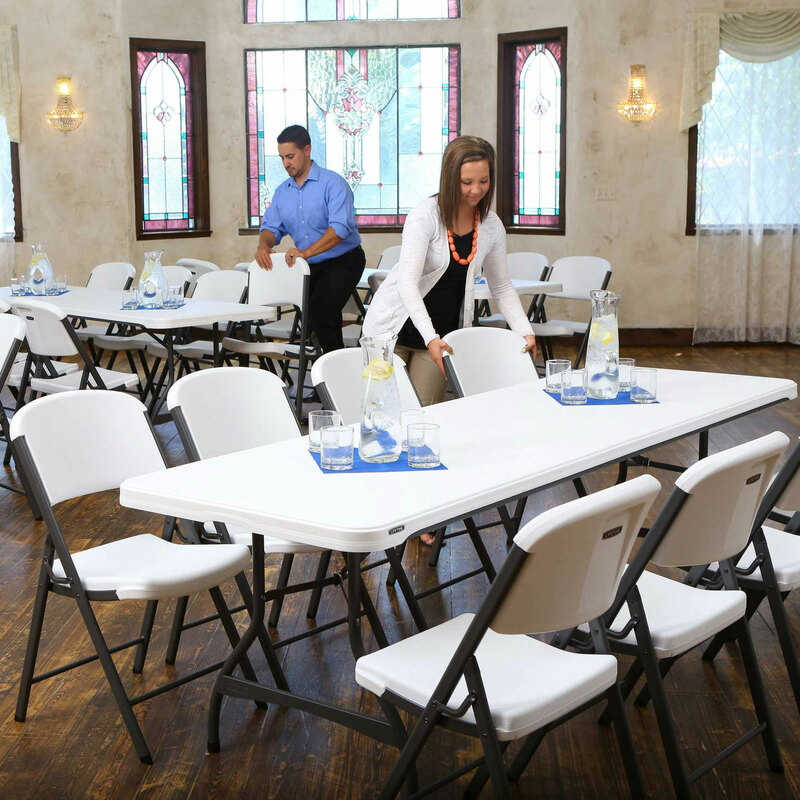 We are members of the Church of Jesus Christ of Latter-Day Saints and our local Ward uses many of these tables and chairs for various banquets. Our city building has these in their multipurpose room and these work great. I've used them at blood drives, when local families rent the hall, and for city and HOA meetings. Nice product. Q: If I order this bulk package deal do I need any other accessories? A: The only other accessory that is commonly ordered is a table or chair cart. 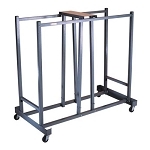 The table cart model number is 80339 and the chair cart model number 6525. Please scroll to the very bottom to see more information about those. Q: In the future if I decide I want more tables or more chairs will they be available in any quantity? A: These are all regularly stocked items. 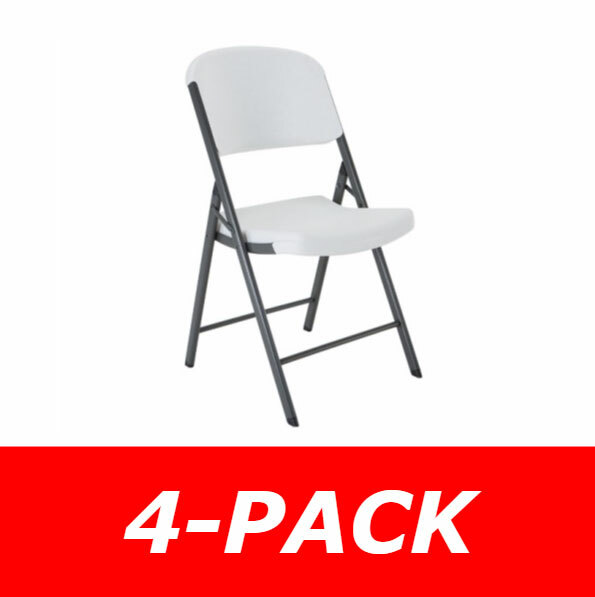 The chairs come in 4 pack quantities and 32 pack quantities. The tables come in 4 pack quantities and 27 quantities. 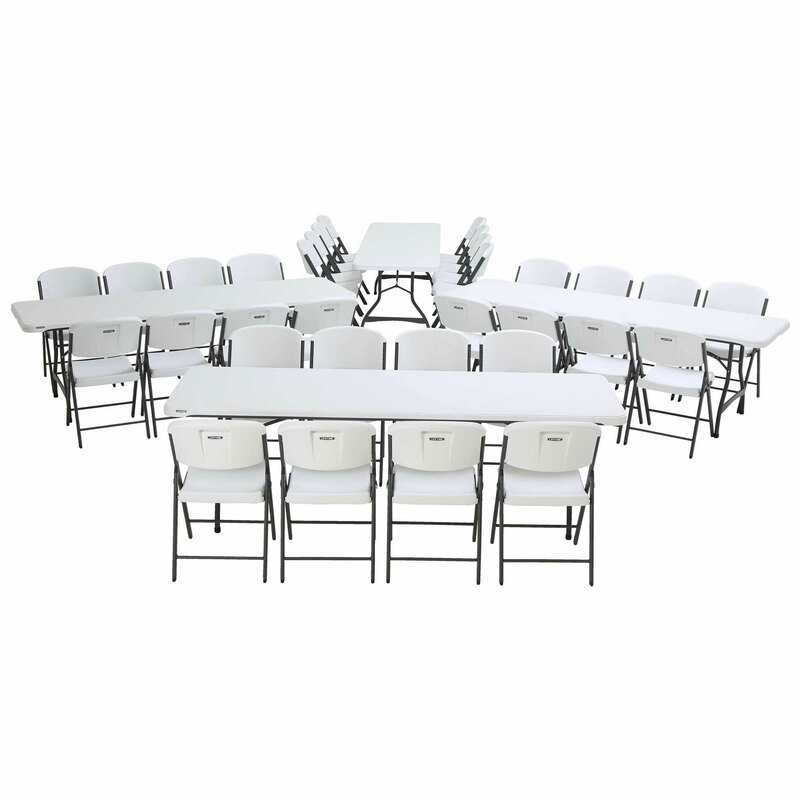 Shipping: Orders for the 80410 Table and Chair Combo generally leave the warehouse the next business day. Delivery Details: This product ships directly from Lifetime Products in Clearfield, UT. Delivery of this product is via a curbside delivery through an LTL carrier (too big for UPS and FedEx). The customer must be present to sign for the order. The freight carrier is instructed to contact you prior to delivery to set up a delivery appointment. 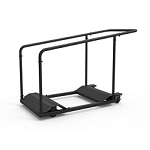 The carrier will unload the product by means of a lift gate. In some cases items may be too large to fit on the lift gate and may require assistance from the customer helping unload box-by-box (takes only a few minutes). Simply hang onto the original packaging and contact us within 30 days of receipt if you are not satisfied with this product. We will have the item picked up at our cost and refund you in full. We are that confident you will love this product!!! Dimensions: 97" x 41" x 63"